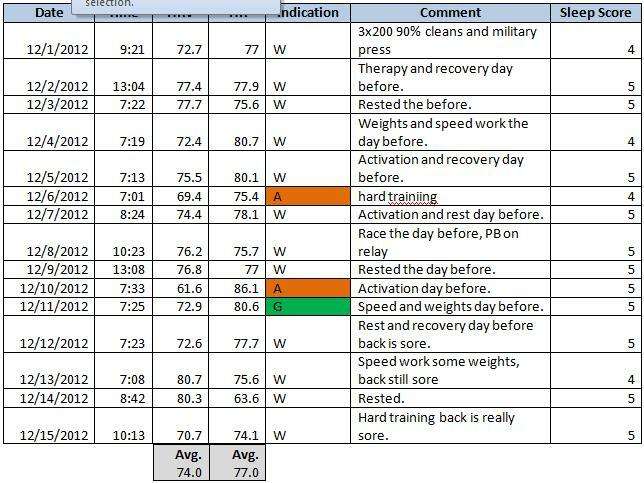 Here is some more data and analysis from a nationally ranked high school sprinter (Junior) that I have using ithlete. Please note that the sprinter trains primarily with his sprint coach. I work with him roughly 3 days/week on mobility, restoration, etc. 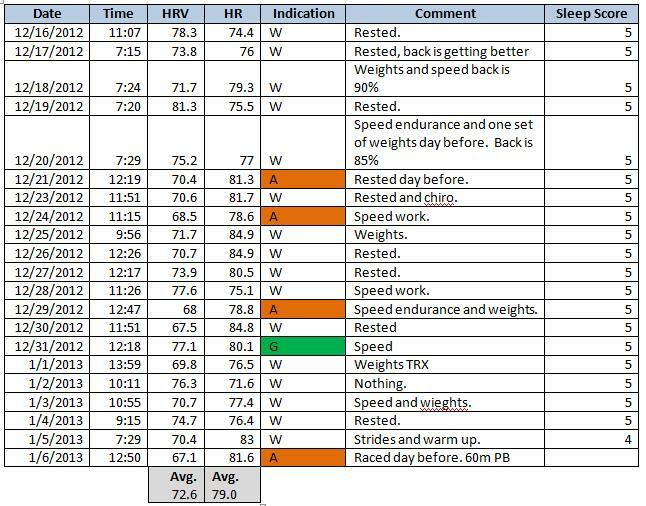 He was an ideal candidate for monitoring HRV as he is an extremely motivated and dedicated athlete and there was no doubt in my mind that he could handle the daily measurements. The data stops in early January because he somehow broke the HRV receiver I gave him. A new one has been ordered recently I’ve been told. This data collection is primarily for observational purposes since I do not control or manipulate his training as mentioned above. After 1 week of using ithlete, I had him start using the comments section and sleep score. His resting heart rate was higher than I expected. I had him perform his measurements standing but in hindsight I should’ve had him do them seated based on his RHR. 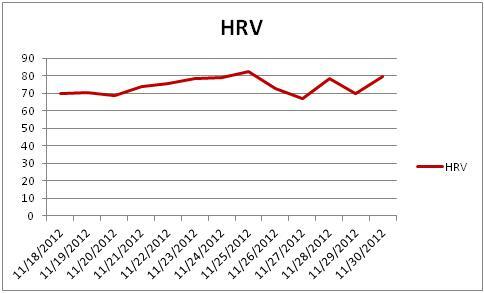 HRV average is mid 70’s which is what I expect from an anaerobic athlete. Still would expect his HR to be at least in the high 60’s in standing position. Clearly he stays up super late on weekends and sleeps in late. Been on his case about this. 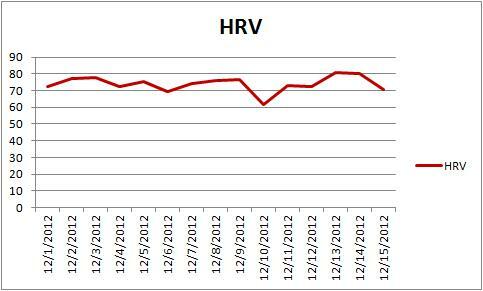 HR/HRV average remains consistent. Coping with training well. Race day on 12/7, hit a PB in his part of the relay. Not a hard race, treated as practice. Reports of back soreness that persisted long enough for him to seek treatment (documented in next table). This last section of data is from his Christmas break. 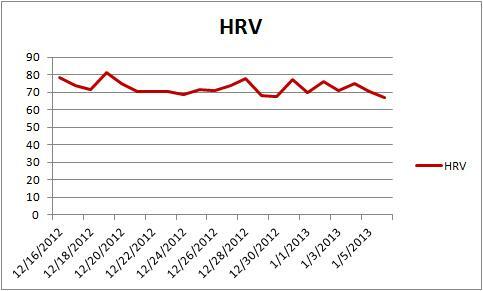 Interestingly his HRV average drops and his RHR increases. I attribute this to the change in routine (off of school), staying up late regularly, etc. I also notice changes in my HRV when my routine is interrupted. The body likes consistency. Things appear to be going well though as he seldom gets below baseline scores (amber). Race day on 1/6 and hits a PB on 60m. Given that this athlete is still young and taking advantage of “newbie” strength gains, I would expect him to hit PB’s relatively consistently on the track. Based on his trend, fatigue was never really an issue. More training may have been well tolerated. I’d like to get him to start using the training load feature too now to get a better idea of how hard his workouts are (perceptively). This entry was posted in Heart Rate Variability and tagged analysis, data, heart rate variability, HRV, iThlete, monitoring, observations, Sprinter. Bookmark the permalink. Very very cool stuff buddy and thanks for sharing! Awesome! While this is a case study, I find these to be interesting. I would agree with you on the higher resting HR, even standing. The key question of course is, if it goes down over time does his performance go up? I would guess yes, but only time will tell. 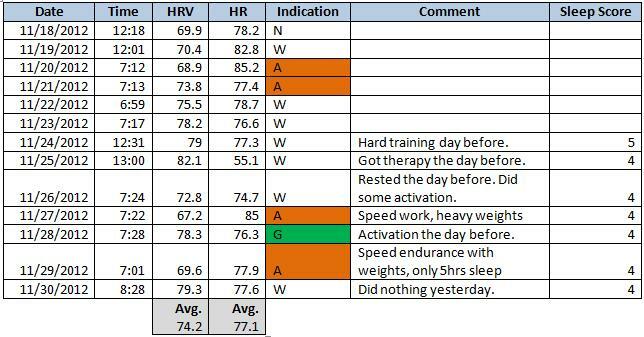 While everyone’s HRV score will vary and direct comparisons from one to the next are very tricky, I would agree that he appears to be tolerating the overall stress quite well. As for sleeping in, I used to tell my clients NOT to sleep in, but after tracking my own sleep for almost 1.5 years now (Zeo), I find that I need to sleep in to ‘make up for” REM and total sleep debt repayment on weekends. Now I try to get more sleep during the week and the weekends take care of themselves( but it does not always happen). Always open to your thoughts! Thanks for sharing your thoughts, Mike. I always appreciate your take on this stuff. I’m okay with the whole sleeping in thing. I guess what I didn’t mention was that he was sleeping in because he’s up all night playing video games. He’s a kid and it’s the only time he has during the week to enjoy some downtime so I don’t harp on him too much about it. But I’d obviously prefer a more reasonable bed time. But like you said, I wouldn’t want him to not sleep in if he insists on staying up til 3:30am. When I was 16 I was doing the same thing so I can’t be too hard on him. I still need to get me one of those sleep Zeo’s!